The Economic and Financial Crimes Commission (EFCC) says it has arrested six suspected internet fraudsters also known as ‘yahoo yahoo boys’. The suspected fraudsters were said to have been picked up in one of their hideouts, Kubwa area, Abuja. The suspects are Ihoeghian Aghasomwan, Precious Osarumen, Enabulele Osazee Frank, Osahon Scott, Efe Ehieorobo and Peter James. 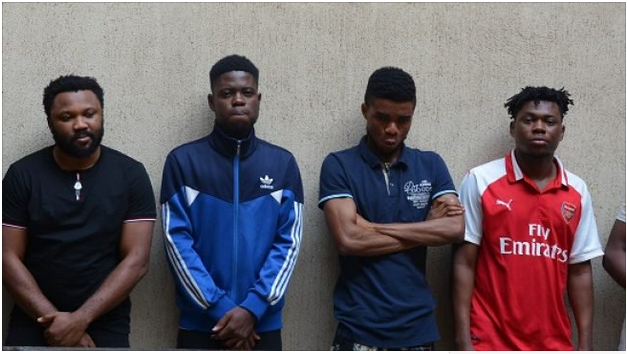 0 Response to "Six ‘Yahoo’ Boys Arrested By EFCC At Their Hideouts In Abuja (Photo)"